W naszym asortymencie mamy jeszcze więcej urządzeń, np. firmy Vitalis oraz innych, znanych producentów. Mogą Państwo zadzwonić do nas pod numer 223 074 321 lub wysłać nam e-maila na adres info@fitshop.pl. The DVD can only be played and used in conjunction with the corresponding FitViewer system! 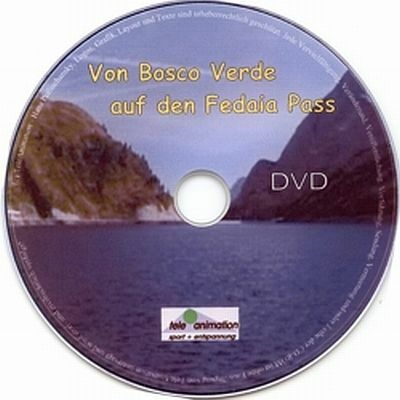 The FEDAIA-PASS and the Rif. E. Castiglioni, the goal of our tour today, is located at 2057m sea level on the north side of the highest mountain of the Dolomites, the MARMOLADA. The water of the glaciers flows into the Fedaia reservoir at the base of the mountain at a height of 2057m. This ca. 12km long tour starts at the entrance of BOSCO VERDE in the Val Pettorina shortly after the village ROCCA PIETORE. The section of the tour that is now ahead of you is also part of the Giro d´Italia and is every bit as challenging as one might expect. On this section of the tour one is confronted with inclines of up to 15%. On the relatively easy beginning of the route to the Fedaia pass, you pass the small town of SOTTOGUDA at 1252m, an important center of the blacksmith trade. After this village, the incline increases noticeably and you have to clamber up the rock face above the SOTTOGUDA-CANYON (well worth seeing !!! ), which you will cross on a bridge before a street tunnel. The tour continues moderately steep. After the small village of MALGA CIABELA things get really serious in the FEDAIA!